US President Barack Obama welcomed the deal, saying it would “help prevent Iran from building a nuclear weapon”. Iranian President Hassan Rouhani said Iran’s right to uranium enrichment had been recognised. Israel, however, said the agreement was a “historic mistake”. World powers suspect Iran’s nuclear programme is secretly aiming at developing a nuclear bomb – a charge Iran has consistently denied. In a nationwide broadcast on Sunday, President Rouhani repeated that his country would never seek a nuclear weapon He hailed the deal, saying it met one of Iran’s fundamental principles. “No matter what interpretations are given, Iran’s right to enrichment has been recognised,” he said…. To say that this “coup for John Kerry” is monumentally stupid, with global implications, doesn’t even come close to my reaction when I first heard this late last night. Am I the only one who noticed that again, the current US administration ‘concludes’ yet another ‘historical agreement’ under dark of night? Wonder if they left the washable red crayons at home? What was achieved last night in Geneva is not an historic agreement; it is an historic mistake. Israel is not bound by this agreement. The Iranian regime is committed to the destruction of Israel, and Israel has the right and the obligation to defend itself, by itself, against any threat. ‘Historic mistake’ is absolutely right, and proves – yet again – that the MIC and his mouthpiece John Kerry are wilfully ignorant of the FACTS of history. Israel knows better than anybody what any student of history should know. 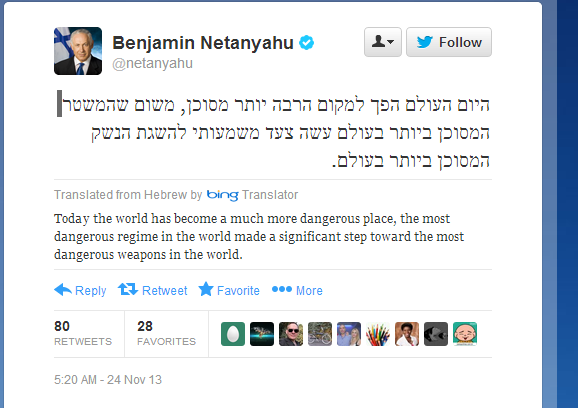 They live with the constant threat from Iran, who is on the record, repeatedly, as vowing to wipe Israel off the map. Israel also knows well, as MIC et al seem determined to ignore, that appeasement of such murderous regimes as Iran, does NOT work. 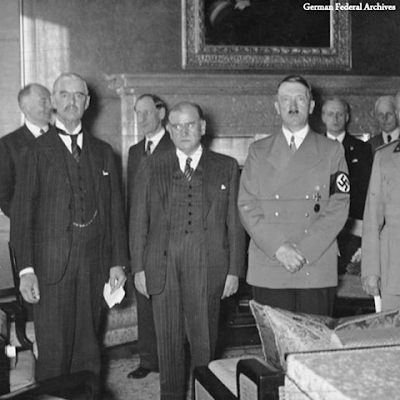 In 1938, after signing the Munich agreement with Adolf Hitler, British Prime Minister Neville Chamberlain declared ‘peace for our time’. Yesterday in Geneva, the US and global powers signed an agreement with Iran easing sanctions for ‘peace’. Israel will not allow the past to repeat itself. As the world msm applauds this bright new day, I heard Kerry quoted as saying that ‘no, human rights in Iran were not part of this negotiating process.’. I have to ask: Why not????? As the title of this piece says “Neda was unavailable for comment“. 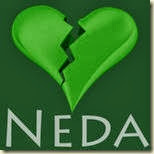 Neda, for those who forget, was one of those Iranian citizens who was gunned down and murdered in the bloody aftermath of the 2009 elections in Iran. Need reminding? Go here, (with graphic video) here, or here to read what the current US administration said about human rights abuses in Iran.. US President Barack Obama has ordered for the first time sanctions against senior Iranian officials for “sustained and severe violations of human rights”. The eight men include the head of the Revolutionary Guards, a former interior minister and the prosecutor general. The treasury department said they would face a travel ban and asset freeze. The alleged abuses include the killings and beatings of anti-government protesters after the disputed presidential election in June 2009. On the night of November 23, 2013, the President of the United States left an American pastor, Saeed Abedini, behind. The “deal” with Iran announced tonight by President Obama, which allegedly halts “part” of Iran’s nuclear program, allows Iran to enrich uranium and allows it to maintain a nuclear program in exchange for an easing of sanctions and humanitarian relief. The Obama Administration did not volunteer this information; it was revealed only after a specific inquiry from Fox News. For more than a year, Pastor Saeed has undergone torture at the hands of his Iranian captors, most recently being transferred to one of the most deadly prisons in the world. Yet instead of demanding the release of this innocent U.S. citizen as a precondition to any negotiations with Iran, the Obama Administration is relaxing sanctions and providing humanitarian relief, while getting nothing but more meaningless promises in return…. Read the rest of this here. Quoting the prosecutor general, ISNA reported on Monday that the case of former U.S. Marine Amir Mirza Hekmati “has been sent back” to a lower court for retrial. The 28-year-old Hekmati was arrested in December. Iranian TV showed Hekmati in December appearing to confess his crimes, in a mixture of English and Farsi. Hekmati talked of receiving language training. Hekmati said he received the training at U.S. bases in Iraq and Afghanistan before traveling to Iran. His family said he was in Iran visiting grandparents. VoA. Please continue to send letters to Amir Hekmati. DETROIT A former U.S. Marine held in Iran for two years said in a letter to the U.S. secretary of state that he has endured “miserable prison conditions” and believes Tehran is holding him hostage for use in a possible prisoner exchange. Amir Hekmati’s letter, handwritten and dated Sept. 1, was addressed to John Kerry and first published Wednesday by Britain’s Guardian newspaper. 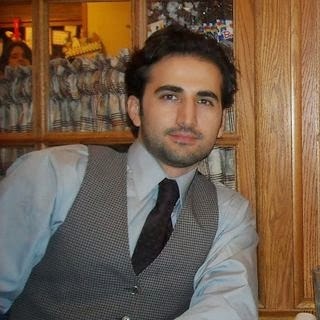 Hekmati, 30, wrote that he has been “held on false charges based solely on confessions obtained by force, threats, miserable prison conditions and prolonged periods of solitary confinement. “This is part of a propaganda and hostage-taking effort by Iranian intelligence to secure the release of Iranians abroad being held on security-related charges,” he wrote in the letter that the Guardian said was smuggled from the prison. Hekmati has been detained in Iran on what the U.S. says are false espionage charges since his 2011 arrest. Hekmati’s family says he traveled to Iran to visit his grandmothers. The letter goes on to say that while Hekmati and his family “have suffered greatly,” he “will accept nothing but” an unconditional release. The State Department late last month repeated its call for Tehran to release Hekmati and two other Americans…. 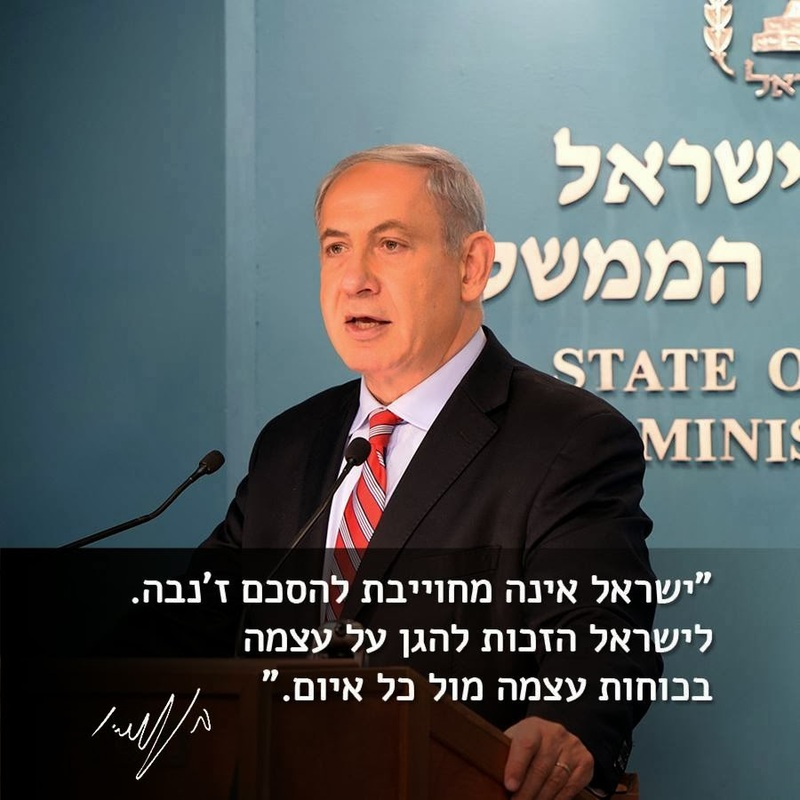 In the midst of all the back-slapping and applause, there is at least one country – other than Israel – who was swift in speaking out about this latest turn of events. Can you guess which one? No ‘thumbs up’ from Canada. Foreign Affairs Minister John Baird says he is “deeply skeptical” of the newly brokered nuclear deal with Iran and says Canada’s sanctions will remain in “full force” against the country. “We will evaluate the deal reached not just on the merits of its words but more importantly, on its verifiable implementation,” Baird said at a news conference in Ottawa on Sunday. There are so many things wrong with this ‘interim’ deal, not least of which IS the global impact. No matter that MIC et al would have us all believe that a new era of kumbaya is upon us, wishing AND empty rhetoric doesn’t make it so. I have been saying for a while now that we live in very dangerous times. For more reaction, go here.